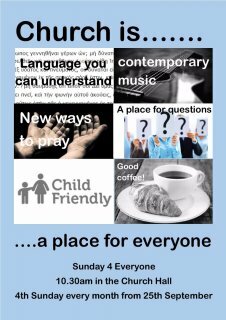 Sunday 4 Everyone is a new service designed especially for those who are not used to coming to church, and for those with children. We begin all together with drinks and something to eat from 10.30, and then have a little time together before the children go off to separate activities. For the adults, we continue with some time reflecting on the bible together, and remembering and responding to what God has done, perhaps by singing, or doing a prayer activity, or having the chance to talk and pray for one another. We expect to meet with God as we meet with each other, and to grow and be encouraged in our faith. There is always contemporary music, and the chance to ask questions. If you haven't been to church before, or aren't sure about more traditional types of service, this could really be the one for you. It's called Sunday 4 Everyone because it happens every 4th Sunday in Stoke Holy Cross Church Hall - and we really think it's for everyone.